I attended dinner party recently to say goodbye to another dear friend of mine moving away. Charged with bringing a sweet treat, I wanted to make something healthy, refreshing, and incredibly delicious. I don’t know why, but for some reason the most random song came to my head – a song from that children’s show The Wiggles my little sister always used to watch and sing around the kitchen. The song repeats the phrase “fruit salad, yummy, yummy” over and over again. Fruit salad. Yes! Perfect choice. Fruit salad is truly an all-purpose dish. You can have it with breakfast, lunch, dinner (better yet “brinner”), or dessert (especially over vanilla ice cream). While you can make fruit salad by simply chopping and combining your favorite fruits, adding flavors brings a little more “oomph” to it. Fruits like apples and bananas also brown easily when exposed for a period of time. Do you want to serve your guests brown fruit? Do you want to eat brown fruit? I didn’t think so. My solution? Add honey, cinnamon, lemon juice, and lemon zest. That’s it! 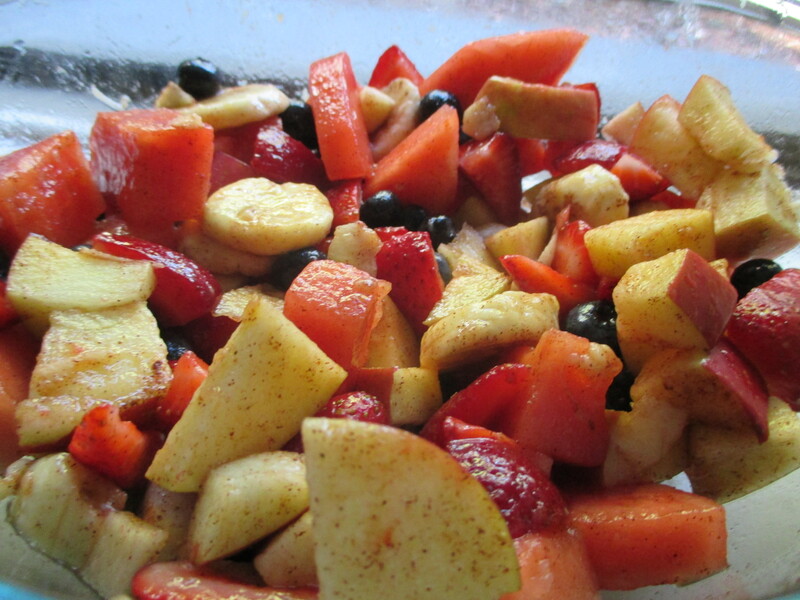 This fruit salad tastes like I’m eating freshly made pie filling, but without the inches-on-the-hips adding crust. 1. Wash your fruit (the apples, blueberries, and strawberries in this case). 2. Slice your banana, watermelon, apple, and strawberries. Keep those blueberries whole. 3. Transfer your sliced fruit to a large bowl. 4. Put 1/4 cup of honey into a glass or microwave safe bowl. Warm up the honey for 30 seconds in the microwave so it becomes more liquid. 5. 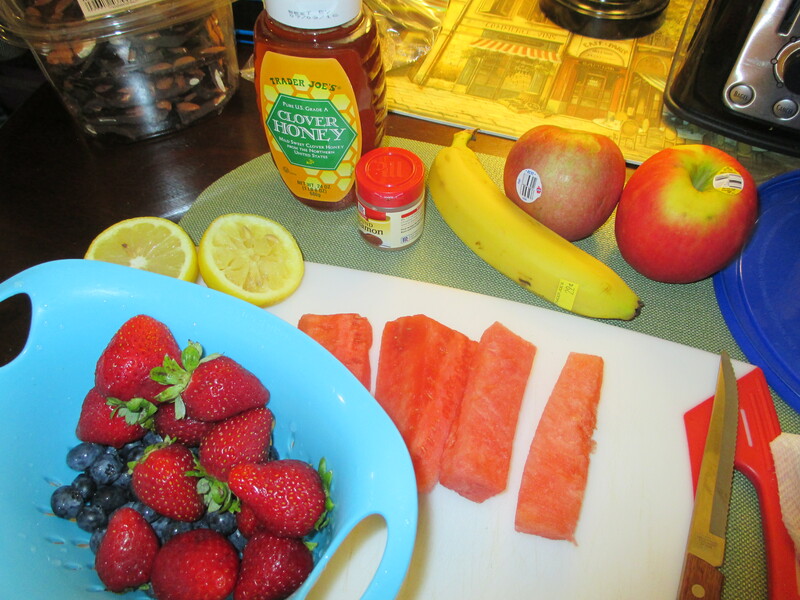 Add the liquified honey to your fruit. Then, add your cinnamon, lemon juice, and lemon zest. 6. Stir all the goodness around in your large bowl. Done! Note: If you let this fruit salad sit in your fridge for a few hours, the sugar from the honey will bring out the juices in the fruit (this is called maceration). 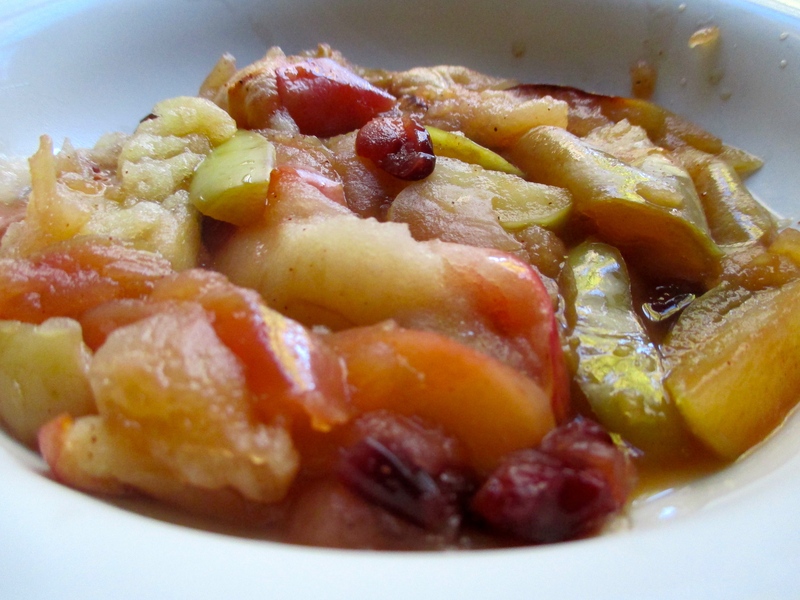 The flavors will mesh even further, and it will taste even more like pie filling. Yum!